When it comes to finding great entertainment furnishings, are you looking for ways to stay “ahead of the game”? It can be more than difficult to find entertainment furnishings–be they TV stands, pool tables, poker tables or CD/DVD storage cabinet–that are at once sturdy and beautiful. 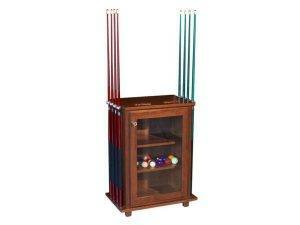 The traditionally-crafted Pool Accessories Cabinet with Scorekeepers blends beauty and storage space. With this in mind, expert Amish-craftsmen have taken the time to create an entertainment furnishing that beautifully blends strength and style: the Pool Accessories Cabinet with Scorekeepers. This finely-crafted piece features Walnut construction, storage for eight pool cues, pool ball storage, two built-in scorekeepers and a large selection of custom options (including stain/paint/dye, hardware and wood species choices). Pieces like this not only provide dynamic and sturdy storage space but also add a touch of style and beauty to the home. It is for this reason that traditionally-crafted furniture is in such high demand! To see more incredible entertainment furnishings like this, visit Brandenberry Amish Furniture and view our entire selection of hand-crafted Amish furniture!